Excitement and anticipation is already building for what will be an unrepeatable and highly prestigious event. 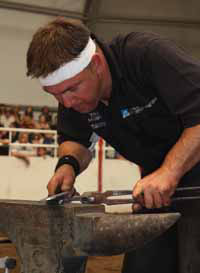 The Mustad Champion of Champions Competition to be held alongside NAFBAE’s Farriery Focus at The Forge, Stoneleigh on 8th May 2010 promises to be the ultimate display of craftsmanship within our profession. Never before have these previous winners of the World Championship Blacksmiths Competition held in Calgary each year been together under one roof at the same time. 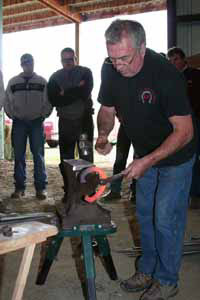 Designed to be an open exhibition of forging and shoeing skills the day promises to be both educational and inspirational. Participants will take part in a single shoeing round broken down into three sections to allow the work to be judged anonymously. Competitors will therefore leave the shoeing floor whilst the judges are present. Each judge will score independently. A drawing of the specimen has been distributed to all competitors; a fullered roadster to be made from 11” of ¾” x ½” bar stock. Marks allocated will be used to identify the farrier scoring the highest marks on the day; no other placings will be given. A charitable donation will be made by Mustad of £5,000 to the charity chosen by the ‘winning’ farrier; all other Champions will receive a further £250 for a charity of their choice. The presentation will be made in the evening at the black tie dinner to be held at the Warwick Hilton Hotel. The unenviable task of judging such a competition can only be undertaken by two of the most highly respected farriers; David Wilson Snr (Scotland) and Marshall Iles (Canada). 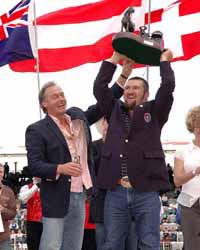 David Wilson BEM FWCF AWCB won the World Champions himself in Calgary in 1985. 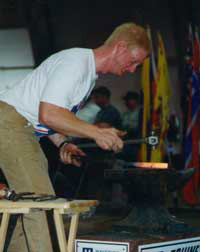 A formidable competitor, David has not only competed at Calgary but judged the competition 4 times. 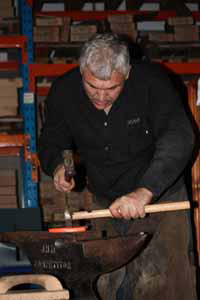 Although officially retired, David still keeps his hand in and at a clinic given last autumn, demonstrated without a shadow of doubt his forging skills are still incredible. David is the 6th generation of Wilson farriers, a tradition which began in 1813, and continues with his grandson Josh being the 8th generation. 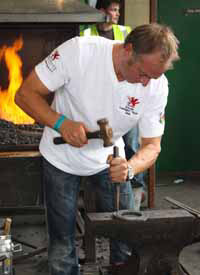 Citing the competition as a “one-off chance to witness these farriers together” David is very much looking forward to the event and judging alongside Marshall. Marshall Iles CJF is a practising farrier in Calgary, Alberta, Canada and works primarily with show jumpers. Well known and highly regarded for his crucial role in the smooth running of the Calgary competition, Marshall is “blown away” at the prospect of judging the Champions, citing many of the competitors as his “hero’s”. An “honour to judge alongside David Wilson”, Marshall believes the event will showcase the “guys that pave the way”. A tremendous event for the farriery industry, Marshall is very much looking forward to travelling to the ‘Motherland’! My very supportive wife and family. My master Steve Langford AFCL who gave me the opportunity to grow as a young farrier, he did put plenty of horses in front of me to practice and the biggest piles of large lump coal to break up in preparation for my shoemaking, then a 45 gallon drum to store my projects in progress. 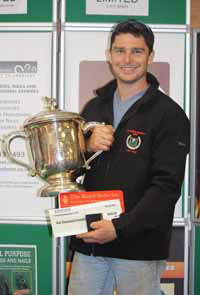 To Tom Williams for being an enthusiastic instructor and mentor, and Welsh team manager who had no choice but to give me a chance as an apprentice to compete for Wales on the Farrier Team in Ireland. He also always had plenty of horses for me to practice on at the weekends. 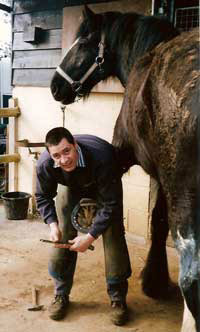 Lastly to my colleagues (fancy word for the other students) on Cosira course 2b who inspired a young Welsh lad to want to be a master farrier, the more I learn the more this seems to be unachievable. From my other world the biggest influences would be my father and mother who both supported me in my farrier endeavours and my wife Teresa and girls Sarah and Rachel who keep my feet on the ground. My chosen charity will be the Riding for the Disabled; this covers two important things to me, kids and the equestrian. The people I meet and work with. My family and learning to fly. Aviation Without Borders / Smiling Wings Days. This charity offers opportunities for disabled and terminally ill children to experience flight in small aircraft. Lance Armstrong Foundation. Cancer of any kind effects ALL of us! He does a great job globally of bringing awareness of that fact. I've been influenced by many different farriers but the guys listed below would have to be my biggest influences; Philip "Tip" Warner, our farrier when I was a child, who started the ball rolling. Billy Crothers and Carl Bettison who gave me an apprenticeship, I finished my training with Billy, who taught me the basics of horse shoeing, which looking back were world class basics and I will always be indebted to Billy for the guidance and inspiration he provided. 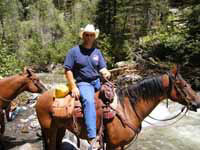 Derek Gardner who I attended college with and who I always aspired to be as good a farrier as and I'm still trying. Gary Darlow, if he's not the world’s best horseshoer then he's pretty close, a man who is still willing to learn even though he's achieved so much, a true inspiration. Ian "Spud" Allison and David Smith fellow members of the England shoeing team when I was starting out, who passed on their knowledge so readily. 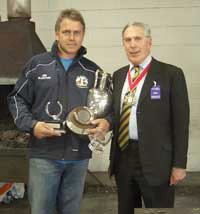 Finally my wing man, and competition partner Brian Saunders easily the most unselfish farrier I know. Outside of farriery my parents have been so supportive of myself and my siblings in our early sporting activities, and have travelled to Calgary several times to watch me compete, although my mum couldn't bear to watch the finals. My biggest influence would have to be my wonderful wife Lucy and our son Beau who have taught me that there is more to life than horse shoeing and farriery competitions. Cancer Research UK. I have had both friends and family who have suffered with cancer and believe we need to do all we can to help those people unfortunate enough to be diagnosed with this disease. Early career – Richard Downs-Evans and Dave Duckett. More recently, fellow members of the Welsh team. Father, and my wife and family. Hope House (Children’s Hospices), Oswestry. Jim and Allan Ferrie who I served my apprenticeship with, and encouraged me to compete. David Varini who is both business partner and friend. Richard Ellis. Influenced by all competitors, striving to be as good as, and better than them! My wife Sarah who has encouraged and supported me for the last 12 years and who has only been happy with 1st place prize money. Neonatal Unit in Crosshouse Hospital, Kilmarnock - due to the fantastic care and support that all the staff in the unit gave when my beautiful daughter Kate spent time there after she was born on 7th December 2009.